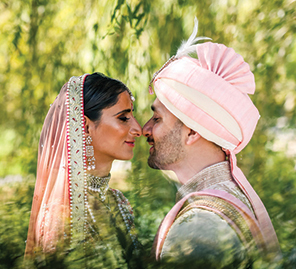 The City of Lakes set the stage for Sheena and Siddharth’s joyful nuptials. 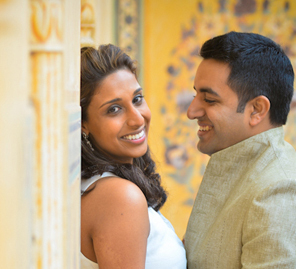 Sheena and Siddharth’s sweet love story was followed by a grand wedding in Udaipur. 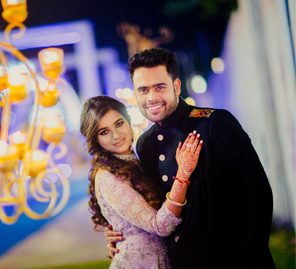 The bride shares with us the highlights of their wedding and pictures clicked by WeddingSutra Favorite Camera Crew. We’d known each other for ages and had met a couple of times but it was a lunch date in 2017 that really got us talking and so began our story. We’d initially thought about Jaipur and Goa but when Udaipur cropped up, we decided to give it a shot. I wanted a palatial feel to my wedding venue and when we saw the Radisson Blu Udaipur Palace Resort & Spa we fell in love with it. We decided that this was where Siddharth and I would exchange our vows. The wedding was planned by Event Entourage. Dream Knots took care of the décor. Our wedding invitations were created by Images, a design company run by my aunt. 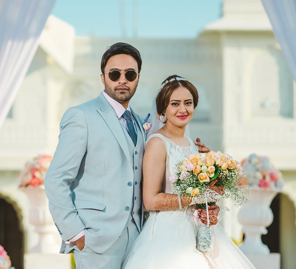 Shabri Pardiwala, my makeup artist, ensured I looked like a dream on each day of my wedding. Bhavna Bhatia was the compere at our functions and DJ Alex had all our guests dancing away to his tunes. Every moment of revelry and beauty was captured by Camera Crew who were in charge of both photography and videography. A bright summer’s day filled with color is what the lingering memory of our mehndi evokes. We used a lot of pink and yellow fabric to build large canopies over the lawns of the hotel. Colorful tassels hung from the roof of each structure. Quintessential Rajasthani elements such as puppets, earthen pots, etc were included in the decor. We even had a cycle rickshaw covered in flowers and a swing set at the venue for some great photo-ops. I wore a light blue and yellow lehenga from Summer by Priyanka for this function. After a very Indian looking mehndi, we decided to have a more contemporary sangeet. Black and gold were the colors of the night and our vision was to drench the venue in the glow of countless candles and bulbs. The night was designed to exude elegance and keeping in line with the modern mood I wore a stylish gown by Nadine Dhody. Fuchsia and white dominated our wedding setup and flowers were a big part of the decor. At the entrance, we had these humorous quotes about marriage which our guests read as they walked into the venue, grinning. We got some amazing reactions. For the function, I wore a beautiful lehenga by Anita Dongre. The reception had international musicians playing Bollywood music on different instruments. DJ Alex was the highlight of the after-party and the baraat. He simply killed it! Everyone enjoyed his music a lot and both parties stretched out into the night thanks to him. Savor and enjoy each and every moment – it will never come back. Make sure you both have fun at the wedding. Each and every person at our wedding told Sid and I that it was obvious we were having the most amount of fun and they’d never seen a bride and groom enjoy their wedding so much. Remember, this is your day, so don’t stress at all! Everything will all fall into place. And most importantly, keep smiling because you will never know when the photographer is shooting you!